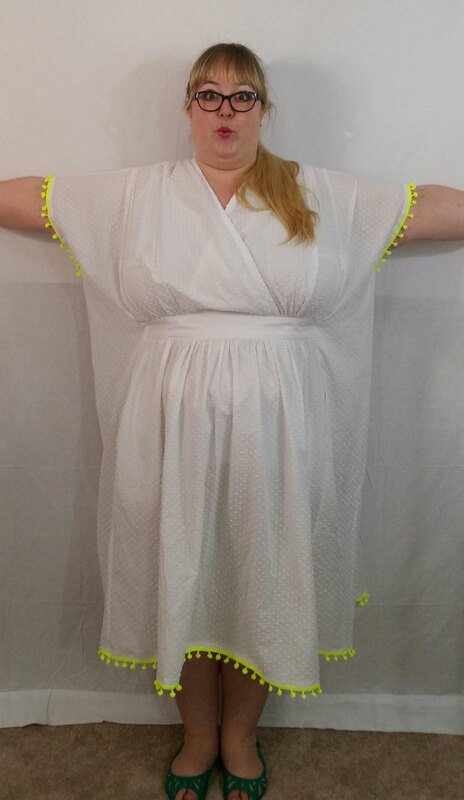 Disclaimer: I received this pattern for free but my opinion, my awesomeness, and fabric is my own. The Decades Everyday T.L.C. Caftan is out today!!!! I might be a little bit excited. Let your inner Mrs. Roper out! The T.L.C. Caftan is in Decades of Style extended sizing (YESSSSS!). It goes up to a 52 inch bust (YESSSSS!). DOS has gone to great lengths to make a caftan that will look stylish and be comfortable. The faux wrap bodice is genius with the waistband. There are ties on the inside to pull the waistband to whatever tightness you want (cheese room!). It emphasizes curves so that a plus sized person doesn’t just look like they are wrapped in a bunch of fabric. There are two options to it: shorter sleeves and skirt or longer sleeves and skirt. It also has pockets hidden in the seam for the side panels and front skirt. 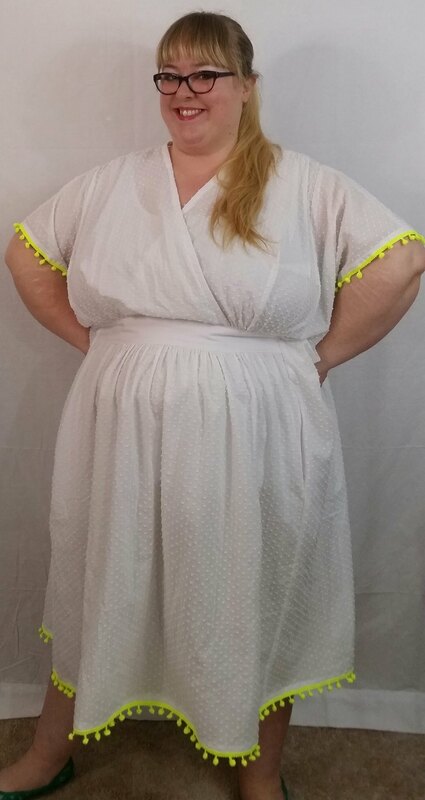 The only drawback is that this pattern needs a huge amount of fabric (edit: Check out the awesome ideas in the sewalong post for using different fabrics!). The full length takes around 6 yards! But the positive spin of that is the stashbusting possibilities! 😉 I am also thinking of making this in tunic length. I could see it being a really pretty tunic. For the bodice, I made size 20 bodice and did a 3 inch FBA as per the instructions we were given (edit: Also in this post on the sewalong). DOS is going to include them in the sewalong so there is no guessing when making an FBA for this. 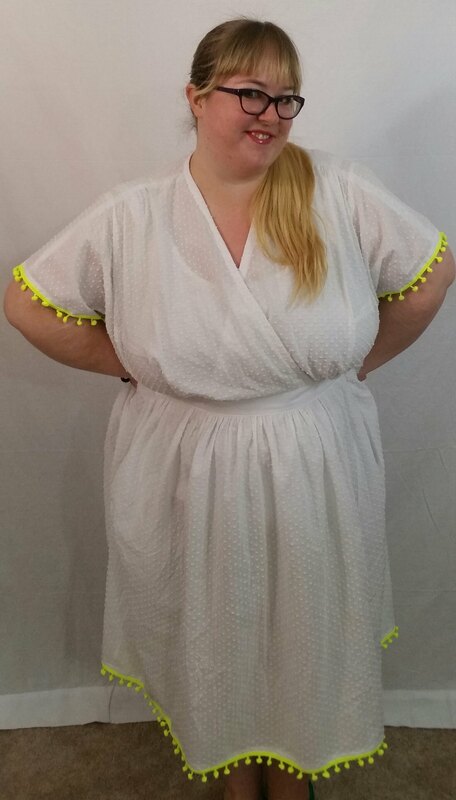 Even though the size 26 would have worked for my bust measurements, I chose to do an FBA, because I wanted the smaller shoulders and neckline to prevent gaping and I did. There is no gaping for me and the wrap bodice comes up higher as well covering my bra nicely. I did use the size 26 skirt pieces and side panels. I have no issues with the fit. The only change for next time is to rotate the dart into the shoulder gathers and the waist gathers. I chose not to do that for this version because I was being lazy but with the sheer fabric you can really see the darts so I don’t want that for the next version. I used white cotton swiss dot with some plain white cotton fabric for the waistbands and the armhole finish as well as the ties inside since I didn’t have white twill tape handy. I added florescent yellow pompom trim to the sleeves and the hem. Use the code CAFTAN20 for 20% off your order at the checkout. Pros: Love the waistband and faux wrap. Love the pockets. Love it all. Love love love love. Cons: Only con is how much fabric I need to make all the caftans. Make again? : ALL. THE. CAFTANS. This is adorable! You look marvelous, as usual! This looks amazing on you Andie! The back view, in particular, is lovely, but it’s all great. Oooooh! I LOVE it!! It is much nicer than Mrs Roper’s 70s caftans. Very stylish! And way to go on the no gaping! My measurements are similar, except I have no waist anymore. Having my last baby at 47 kinda killed what I had. 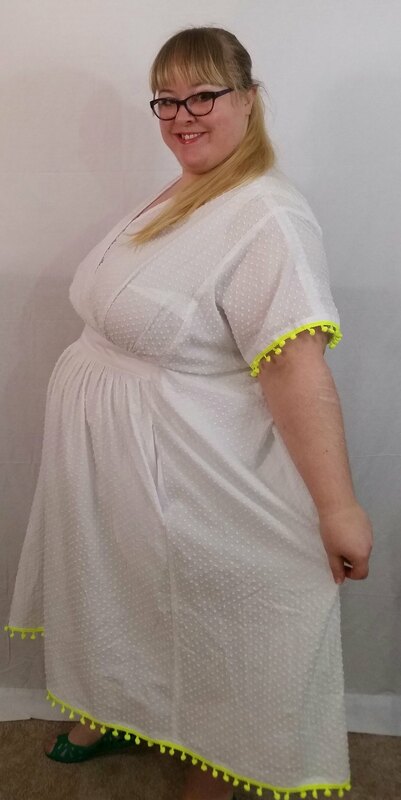 :o) Why do the pattern companies think bigger bust/waist/hips means wide shoulders and neck lines!!! A over sized neck and shoulder happens when the pattern grader continues to grade these parts of the pattern all the way across the entire size range. We do our pattern grading in house and the neck and shoulder grade for the sizes 20-26 are all the same. We don’t grade the shoulders and neck larger than the size 20, which is for a 46″ bust. Hope this answers your question. Pompoms!! Another winner – and what cool style lines! 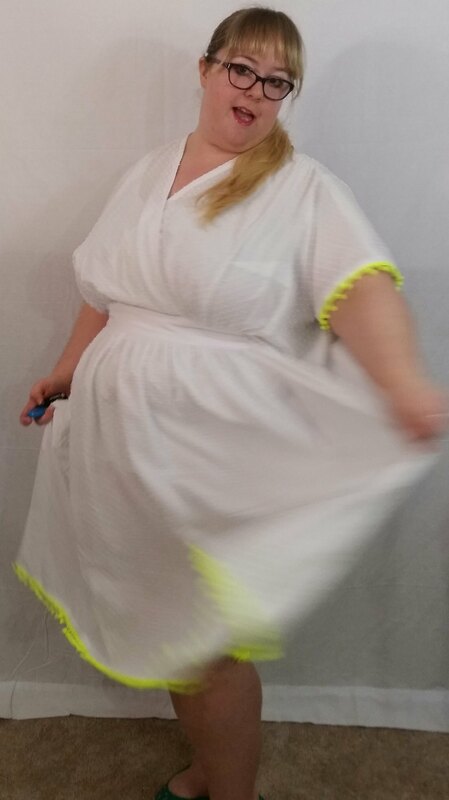 It’s a caftan with shaping! You could definitely make this as a tunic. And it would be really fun in a bold print for summer, too. You have made me want to sew a caftan!! I was admiring your beautifully sewn gathers at the waistband…..so pretty! 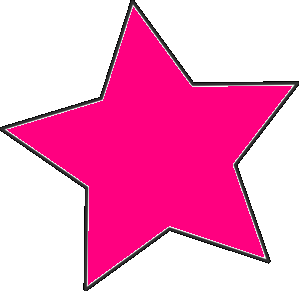 So…..even! Thanks so much, Erin! 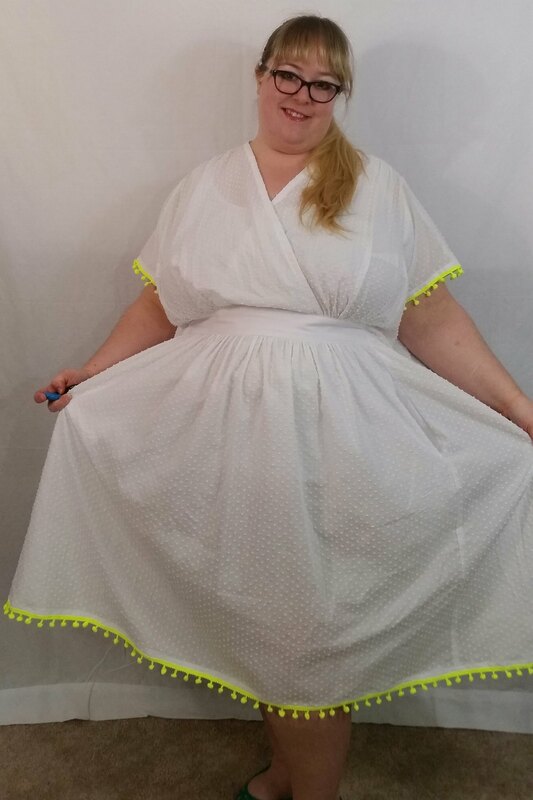 I hope you do sew a caftan! They are comfortable! It looks beautiful on you – a good fit, and so pretty. The DOS Caftan has ties on the inside. So the side panels aren’t tied down and there can be some draping there. 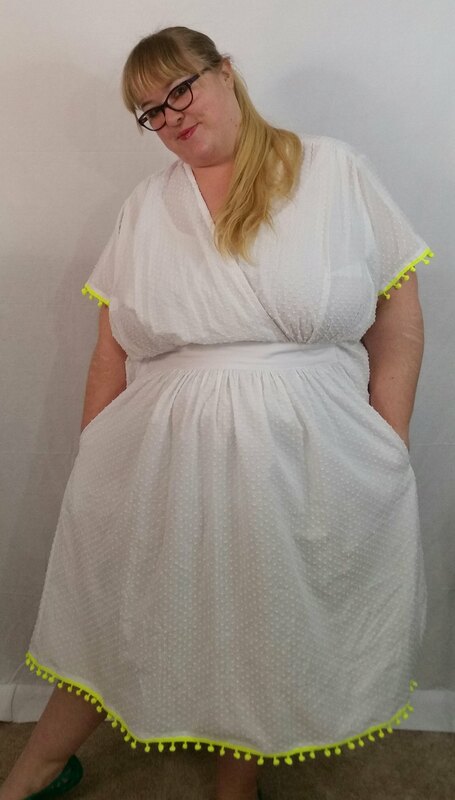 I think the shape is nicer than the Charlie caftan, because the wrap bodice is meant to fit you but the rest is pretty loose. Both styles are nice though. 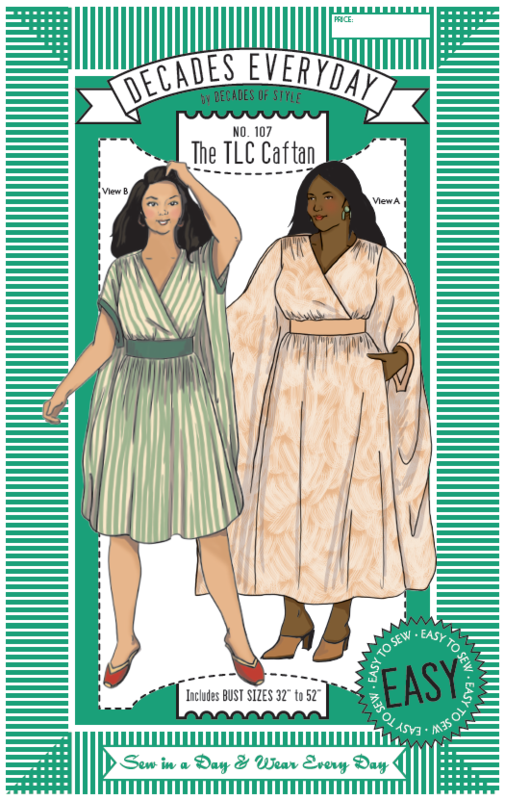 I don’t fit into the CCF size range so for me it’s the DOS caftan.